The variety of environments in the park makes it ideal for all sorts of activities and provides users of all ages and abilities the opportunity for outdoor exercise. The park is a fantastic area to use to help develop a beginner’s biking skills. There are many little spots that can be used to develop specific skills. Though the park does not have designated biking trails with specific technical obstacles, the routes around the park have a considerable variety and can test the experienced rider as much as the beginner. It is fantastic to have such a diverse and beautiful location so easily accessible from the centre of Stirling. There are many different routes and different types of habitat that you can cover with your dog in Plean Country Park, and virtually every time you come, you can take a different route! Why not explore the Wildflower Meadow in front of Plean Country House, or take a walk down the main drive and enjoy the majestic tree line. Often in the winter, you can see deer in the meadow at dawn. A variety of habitat brings a variety of birds, squirrels, rabbits and some fascintating insects, including dragonflies and bees. There are a few points to remember. Well controlled dogs are welcome to walk off the lead, but bear in mind that there are other park users including children and horses. If you are on a horse trail, keep your dog close and on a lead and give way to riders. Please also remember to pick up after your dog so everyone can enjoy a clean environment in Plean Country Park. 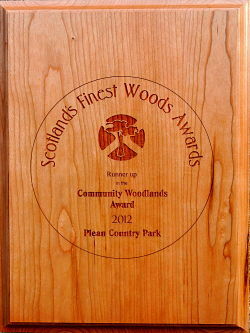 Plean country park is a great place to walk and has a good network of paths and tracks providing a variety of routes. If you are new to the park it can be a bit daunting, so until you find your bearings it is advisable to follow one of the signposted routes which are marked by four different symbols. In time you will enjoy investigating the many unmarked paths within the park. However one of the most important things to remember is that you must think about other park users. The paths and trails are for everyone's enjoyment so expect to meet people on foot, bike or horse. Remember that some people may be scared of dogs or horses so always keep animals under control. The Nature trail (about0.75km) is marked by the symbol of a dragonfly on a yellow background. The route along tarmac paths and surfaced drives is level and suitable for the very young, the elderly and those with a mobility or sensory disability. The nature trail starts at the car park, follows a tarmac path leading to the dipping pond, through the picnic area at the back of Plean House ruin, before returning along the North Drive to the car park. The Estate trail (about 1km) is marked by the symbol of a fungi on a red background. This route on tarmac paths and surfaced drives takes you through the core of the estate. The trail starts at the car park, passes by the former Walled Garden before a short descent on a tarmac path to the Plean Burn, near the Stables ruin, before approaching the Plean House ruin and passing past the front of what is still considered to be the centre piece of the estate. From here you have good views over the meadow. The Estate trail continues along the North Drive before returning to the car park. The Heritage trail (about 1.3km) is marked by the symbol of the arched Stable entrance on a blue background. This route is mostly surfaced paths and drives and includes some slopes and steps.The heritage trail starts at the car park, passing by the Walled Garden before crossing the Plean Burn near the site of the former Laundry. The route runs parallel to the burn and approaches the Stables ruin from behind, before re crossing the burn and continuing to Plean House ruin along the same route as the Estate trail. However, instead of continuing along the North Drive the route climbs a stepped path to emerge from the woodland into the upper meadow. the now unsurfaced path continues along the edge of the meadow before descending into the woodland and emerging out onto the North Drive before returning to the car park along the same route as the Estate trail. The Woodland trail (about 2.9km) is marked by the symbol of a Horse Chestnut leaf and flower on a green background. This route is a mixture of tarmac paths and surfaced drives, including steep descents and climbs. The Woodland trail starts at the car park ,passing the former Walled Garden on the same route as the Heritage trail. Crossing the Plean Burn and running alongside the events field and through woodland to come out at the Gamekeepers Cottage. The trail joins the drive leading up from the Forrester's Lodge and runs through mixed woodland before descending to join the South Drive near the lade. The trail continues down the South Drive which runs alongside the Plean Burn, before climbing up through mixed oak and beech woodlands. Continuing through an area of self seeded scrub and passing by the Fire ponds. The trail passes through mixed woodland and by a wooded roundel before crossing meadow and returning to the car park. The Horse trail ( about 4km) is marked by a horseshoe on a yellow background. The trail covers a variety of mostly unsurfaced tracks which include both the north and south bings. The Horse trail leads from the designated trailer park accross the Plean Burn, passing by the Old Quarry before crossing what is known as Sandy Lane and circling the south bing where the equestrian jumps are accessable. The route returns accross Sandy Lane and descends down the canter section to the Stable block ruin. The trail then goes of to the right and folows along the side of the Plean burn to join the South Drive before climbing up to the western edge of the meadow and descending again to the Fire Ponds. The trail then climbs up onto the ridgeline of the north bing passing close to the boundary with Plean Pre-cast and joining the North Drive. A new section of Horse trail has recently been added which takes riders from the North drive through the wood and by the end of the car park before crossing the main entrance drive and leading back to the trailer car park.